Today is the feast day of Saint Leo II. Ora pro nobis. Saint Leo II date of birth is unknown. He was a Sicilian, and son of one Paul. Though elected pope a few days after the death of St. Agatho (10 June, 681), he was not consecrated till after the lapse of a year and seven months (17 Aug., 682). The pontificate of this great Pope was very brief but very fruitful, since in the ten months of his reign he accomplished good works which have caused his name to be blessed. 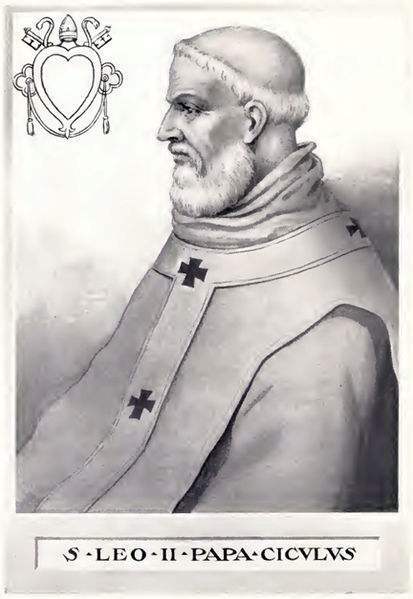 St Leo II had been a Canon Regular. He was charged with recitation of the Office in the cathedral, and was relied upon to serve as the auxiliary of the Ordinary. Saint Leo was a devout student of Holy Scripture, and was well versed in the Greek as well as the Latin language. In his day grave difficulties frequently arose between the Holy See and the emperors of Constantinople, whose representatives at Ravenna tried to control the bishops of that see; the latter had been striving to become autonomous. Saint Leo published a decree ordering that in the future no bishop of Ravenna could enter into function before being consecrated for that office at Rome, by the Roman Pontiff. He built three churches in Rome, to honor Saint Paul the Apostle, Saint Sebastian, and Saint George. Saint Leo was highly gifted in the domain of music, and he renovated the Gregorian literature or library, then in a state of confusion; he also composed new hymns, still conserved by the Church. He took special care of widows and orphans and the poor in general, relieving their sufferings with a truly apostolic charity. Saint Leo confirmed the Acts of the Sixth Ecumenical Council which his predecessor had convoked at Constantinople against the Monothelite heresy, and translated its acts into Latin for the benefit of the Occidentals. When he died in July of 683, his death was deeply regretted by all the faithful. He was interred according to established custom in the church of Saint Peter. He is ordinarily pictured embracing a beggar or holding a book of music.